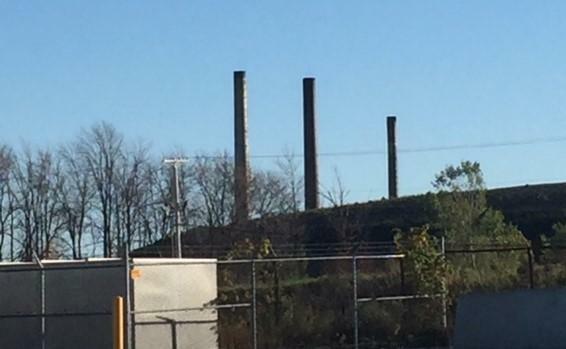 The coke oven batteries are being slowly cooled, as all facilities at Tonawanda Coke are being shut down. The company said on Friday it was shutting down because the money ran out. The New York State Department of Environmental Conservation said on Sunday that work has started and the state Labor Department was on site talking to the about-to-be-laid off workers about their options. "We’ll be here for as long as we’re needed to help these men and women access the benefits they need and most importantly, find them new jobs,” said Department of Labor Commissioner Roberta Reardon in a statement. Shutting the plant means there will be smoke and fire as the coke oven batteries are closed and flushed out. Town of Tonawanda Supervisor Joe Emminger said it all should be done by the end of the week. Jackie James-Creedon, director of Citizen Science Community Resources, said this is the culmination of a decade-old fight over carcinogen benzene. 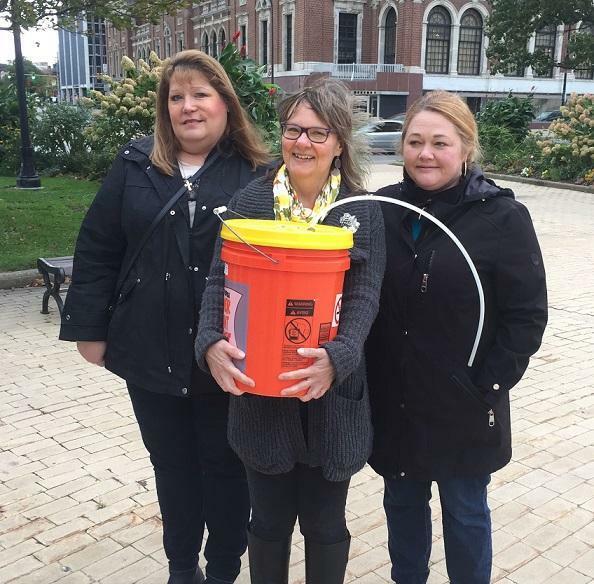 Jackie James Creedon of Citizen Science Community Resources holds the bucket she used in 2004 to collect air samples from Tonawanda Coke Corporation. Joining her to celebrate news of the company's shutdown were Joyce Hogenkamp (left) and Jenn Pusatier. "We wanted it to be a win-win where no one would lose their job, that they could do the right thing, which was to install air pollution control equipment so our residents wouldn't be exposed to the high levels of benzene," James-Creedon said, "and they just kept on fighting us, fighting us." James-Creedon said she is sorry about those who will lose their jobs, but citizens will benefit from the much cleaner air. "Now we won't have to deal with that anymore, which is wonderful. That's the happy part, that's the very happy part of the story," she said, "and also this started with a few residents. I wonder how much of this would still be going on if it wasn't for a few residents that stood up and said, Something's going on here.'" The big issue now will be cleaning up the site. It is already listed as a Superfund site, so there will eventually be cash for a cleanup. "I would think that they would be filing for bankruptcy," said Emminger. "Of course, there is a prior owner of the site, too, and with environmental liability, I have been told you do not walk away from environmental liability, and there is another entity that was in place and I was told that the DEC was going to be having conversations with them." "After the shutdown is complete, the DEC and a multi-agency effort will work to stabilize the site and ensure the proper closure of tanks and disposal of any hazardous materials," said the DEC in a statement. "A comprehensive investigation of the site will also be immediately launched to identify any contamination at the site and develop a cleanup plan through a transparent, public process that ensures community input at every step." Aside from having staff on site, the DOL will also be opening their local career centers Monday to continue providing services. Career counselors and unemployment insurance specialists will be on-site to assist at the Buffalo Career Center (284 Main St, Buffalo, 716.851.2600) or the Niagara Falls Career Center (Trott ACCESS Building, 1001 – 11th Street, Niagara Falls, 716.278.8258). The DOL said two Rapid Response sessions are also scheduled for impacted workers on Thursday at 9 a.m. and 1 p.m. at the United Steel Workers Union Hall, 810 Sheridan Drive, Tonawanda. Computers will be available for affected workers to apply online for unemployment insurance and search for jobs. All workers are welcome at these sessions, whether they are represented by the union or not. Then in the coming days, the DOL will be contacting all workers through the local mail to notify them of future career fair dates and locations, as well as provide information on what services they are eligible for. 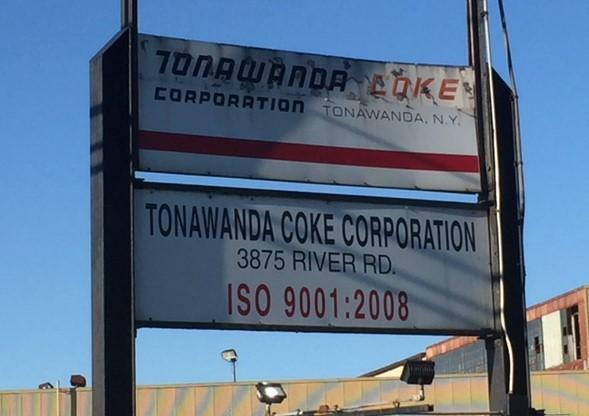 Tonawanda Coke Corporation, which was found guilty several years ago of violating the federal Clean Air Act and was appealing state effort to revoke its air permits, has submitted a plan to close its operations according to court papers made public Friday.